Did Labor Department Leaders Turn a Deaf Ear? Officials are concerned that DOL is not serious about changing proposed rules for on-farm child labor. Iowa Secretary of Agriculture Bill Northey met with top Labor Department officials in Washington recently and says he came away convinced they're turning a deaf ear to concerns in farm country about proposed child labor in agriculture restrictions. "It sounds like there could well be restrictions on not allowing a neighbor kid to help, or somebody to help either with livestock or driving a tractor or a small piece of farm equipment," Northey said. "I hope that doesn't come about the same way, but I actually got more nervous about that after coming back home than I was going in." Senator Jerry Moran, R-Kan., talks with reporters about the DOL proposed on-farm child labor rules. 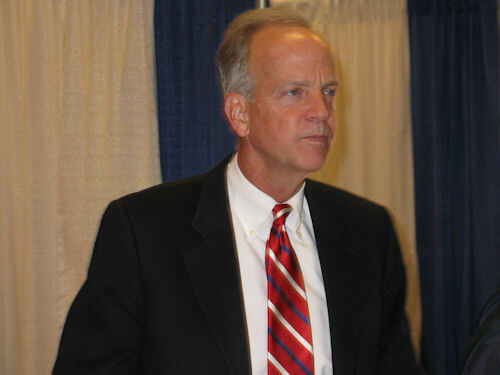 Also speaking out on the Department of Labor's proposed rules to on-farm child labor is Senator Jerry Moran, R-Kan. He says that while the announcement that was made Feb. 1 that DOL would reconsider the rule was good news he says DOL is still moving forward with many provisions that would have a direct impact on farm and ranch families. "They are thinking that they will lull the ag community to sleep on this broader issue that the remainder of their rules are still going to take effect," Moran said. "Those rules are very important. One they define what is an acceptable activity by a young person even though that young person may have the training and education and a permit to do the work. They are trying to restrict what kinds of things a young person can do." Moran says the DOL plans to undercut programs like 4-H and FFA and replace them with some sort of national DOL program. Sen. Moran says the agricultural community must continue to speak out against these rules and pressure DOL into taking another look before impacting the next generation of U.S. agriculturalists. He says some of DOL’s proposal looks more like an animal rights agenda than a valid labor concern. This is a proposal that undermines the ability for us to manage our own farms, to develop a pool of young people who want to grow up and be farmers and ranchers," Moran said. "It is something that if you care about the future of rural America, if you care about the future of agriculture, we've got to make certain the Department of Labor is not successful in allowing these rules to take effect."